Secretary-General Antonio Guterres briefs the media during a press conference at the High Level Pledging Event for the Humanitarian Crisis in Yemen. United Nations Secretary-General António Guterres expressed deep concern on Wednesday over the “recent and sharp escalation” in the Yemen conflict, calling on all parties to make civilian protection a priority. Civil conflict deepened across the country in 2015, when a Saudi-led coalition intensified military operations against Houthi rebels who control the capital Sana’a. Coalition airstrikes hit a government building in the densely-populated Tahrir district of the capital on Monday, reportedly killing six people, and rebels fired several missiles in the days that followed towards different targets in Saudi Arabia. “The Secretary-General reminds all parties to the conflict that they must uphold international humanitarian law, including taking steps to protect civilians,” said a statement issued on behalf of the Secretary-General, by his Spokesperson Stéphane Dujarric. “All potential violations of international humanitarian law should be thoroughly investigated and those responsible for violations must be held accountable,” added the statement. Since political unrest first began in Yemen in early 2011, the UN has been engaged in helping Yemenis to find a peaceful solution. 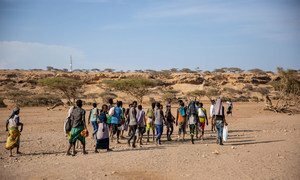 However, fighting continues and the ensuing humanitarian crisis has only deepened in a country that was already one of the region’s poorest. “A negotiated political settlement through inclusive intra-Yemeni dialogue is the only way to end the conflict and address the ongoing humanitarian crisis,” said the statement. With an estimated 7,000 migrants entering Yemen each month, most of them seeking to reach Saudi Arabia and other Gulf countries, the United Nations migration agency on Tuesday called for greater efforts to protect them from smugglers and other criminals.